Prime #4 was the first "full" crossover of sorts I’ve gotten to in this Ultraverse Revisited project, with Prime vs. Prototype. 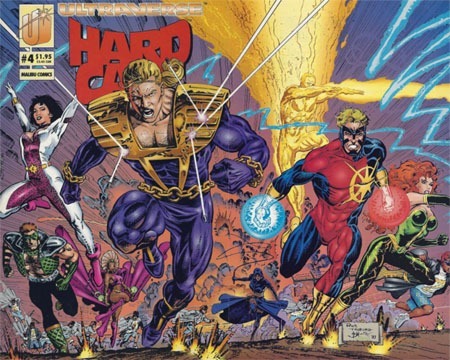 But this issue of Hardcase is the start of the first multi-issue such thing, with the Strangers having appeared on the last page of Hardcase #3, they’re in this issue, and then the story itself continues into The Strangers #4. Hardcase and Choice are just getting back to Hardcase’s place after being assaulted by a team of armored goons trying to kidnap Choice to take her back to the Choice Corporation. So they’re not very happy to find another group of Ultras here waiting for them. After the initial confrontation of surprise, things settle down as the Strangers and Hardcase/Choice feel each other out, so to speak. 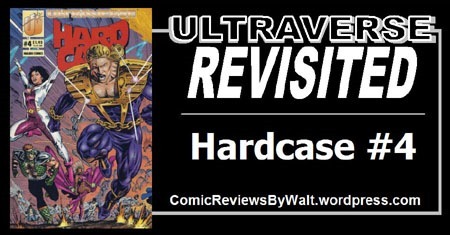 The Strangers want Hardcase’s advice on the whole "being in the public eye as an Ultra" thing, and he’s willing to share what his own experience has been (which also gives us as readers further insight into the events that led up to where we got dropped into the middle of things in issue #1). 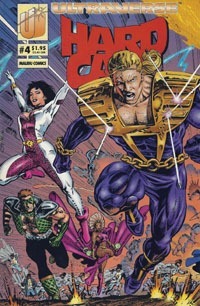 A group called Aladdin has stuff going on–they’re a shady government group, apparently–and Hardcase "connects" them to The Squad’s final battle. The Strangers had their own run-in with the secretive government types, and consider that maybe they’re dealing with the same group. So, with Hardcase and Choice joining them, the Strangers set out (based on info Electrocute has from her time with JD Hunt) to confront the Aladdin folks. They’re not allowed into the facility in question, and the group is actually taken down after a brief skirmish with some Ultras sent out to check on them…ending with some surprise at an off-panel figure that shows up. 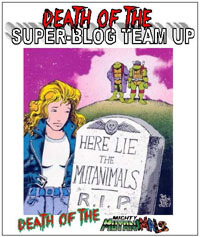 Because of this crossover, this was an issue I have been really looking forward to getting to. I was pleasantly surprised when the Strangers actually showed up at the end of #3, so they’re "here" for the entire issue. And I really liked that we get some (rightful) conflict starting the issue–Hardcase returns home from a fight and there are these strangers (THE Strangers) in his place unexpectedly. But we don’t get some stupid fight with the place being destroyed or such–Hardcase is authentically concerned, but they’re able to talk things out. He realizes they’re not there to do him or Choice harm, so he’s even comfortable enough to leave them in the main space while he grabs a shower–telling these unknown Ultras that he’s going to be completely without any armor/etc! It’s a bit cheesey the way everyone interacts, but it works well enough for me. Hardcase sharing his background with the Strangers is a great excuse to get more detail of that out there, given the way we were given the very end in the first issue and just Hardcase dealing with stuff present-day since. The "cheese" continues as Electrocute just happens to have information about a base Aladdin might be operating from, and when the group just simply goes there, where they just happen to wind up in a fight because of Ultras that ARE there. Still, things keep moving forward at a decent pace, and we’re shown macro and micro interactions that make the characters ring true with a definite feel of authenticity individually and as a group. Visually, I feel like this title’s all over the place…with this issue having the third different art team in four issues! That said, Robinson does a good job of keeping everyone recognizable and clear…there’s really no mistaking any of the characters, even when I’m still not able to rattle off all the Strangers’ names just off the top of my head. They’re visually distinct and familiarly so. That I notice we’re on the third artist of the title is more paying attention to the credits, as it’s not something I’d have noticed as certainly "just" reading through. The cover is by Strangers artist Rick Hoberg, which adds its own positive to this. And the cover itself is another point of discussion. While Prime #4 did have a variant cover, this issue and Strangers #4 go out of their way on a physical production level to AVOID doing "variant" covers. This issue has a fold-out front cover…when you open it out, you have this extra panel to the image with Atom Bob and Electrocute prominent. This is the same image from the front cover of Strangers #4. The two issues can fit together side by side and give a singular double-panel image. This issue has the fold-out, though, to give the full image on its own. And the Strangers issue has a wraparound cover to do the same. As we’re getting a bit deeper into the series, there’s just enough space between this and the first issue that it’s going to get very repetitive and potentially impractical to "just" say "get ’em all" rather than grabbing this issue by itself. However, I definitely strongly recommend getting the Strangers #4 along with this to have both parts, rather than this issue alone. Still, this issue can work somewhat on its own…but you’ll be left with an unresolved cliffhanger if you grab this in isolation. I enjoyed this, and look forward to the second part of the story in Strangers #4, even as I truly can’t think who the mystery figure on the last page is (though I imagine I might wind up kicking myself for not realizing). This issue is definitely worth at least 25-50 cents to buy and read, and is best paired with The Strangers #4.